1. What Materials Can I Use My Diamond Drill Bits On? 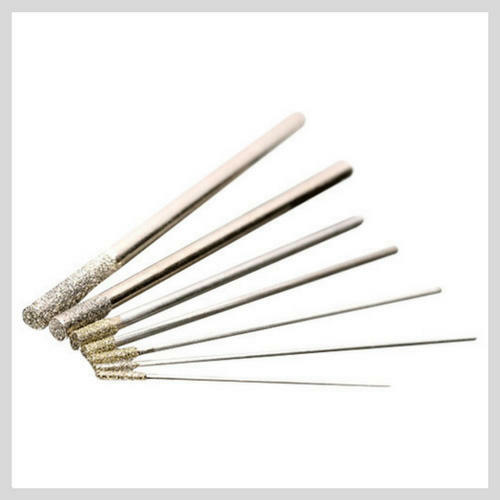 For jewellery making purposes and precision holes in precious stone we recommend using the small diamond drill bits which have a solid, flat end, or tip. These are available in sizes as small as 0.75mm. For drilling holes in plates, glass, fused glass and sea glass we recommend using a small diamond core drill. These are available in sizes from as small as 1mm. Diamond is the hardest material and therefore, anything else can be cut or drilled with it. If you are cutting or drilling through very hard materials such as Sapphire then bear in mind you will need a lot of patience and perhaps more drill bits than you would if you were drilling a hole through glass or Opal. 2. What Are Diamond Core Drills? Diamond core drills are hollow. As with all diamond drill bits you should use water as a lubricant and coolant. Being hollow, allows the water to flow up inside and around the inner core of these drill bits as you are drilling, helping to keep the drill bit cool and removing the debris. These are the best drill bits for rock. Diamond core drills are available in sizes 1mm - 3mm and 3.5mm - 60mm and larger. As you drill, the water swirls around inside the core. This helps prolong the life of your drill bit and helps to prevent any cracking or shattering of the material you're drilling. Small Diamond Drill Bits or Small Diamond Core Drills - Which should I use? Small Diamond Drill Bits have a solid end and therefore a larger surface area so they last longer than the small diamond core drills, but may take longer to drill a hole. They are more robust and therefore ideal for very tough, dense pieces of sea glass, very hard stone, precious stone, gemstones, hard shell, bone and antler. Small Diamond Core Drills will drill a hole quicker than the small diamond drill bits, but will not last as long because they have a smaller surface area. 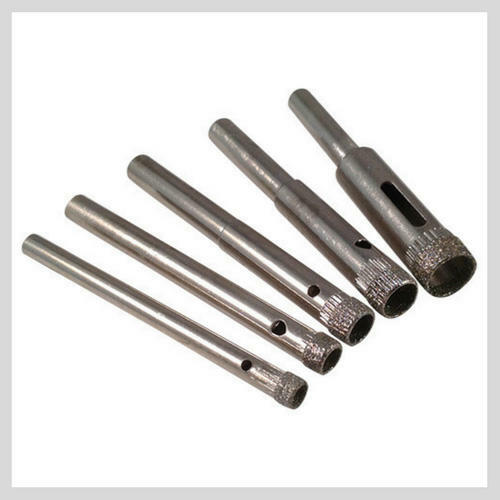 These drill bits are ideal for glass, sea glass, pebbles, stone, slate, ceramic, plates and shell. If you're a regular user of diamond drill bits it is worth having a combination of both small diamond drill bits and small diamond core drills in your tool box as sometimes you don't know if you have a very tough material until you start drilling! Debris stuck inside the core? Drilling in an up and down motion will allow water to swirl around inside the core of the drill bit and in turn allow space for the debris to fall out. Drill your next piece of material and this usually dislodges it. Use a wire brush to dislodge the stubborn core. Each core drill from sizes 3mm and upwards either has a hole in the side or is hollow all the way through the drill bit. Push a pin through the hole or the end to try and dislodge the core. Water is ideal to use as your lubricant when drilling. There are oil based lubricants out there but it's not necessary to go to the expense of buying these, we've tried and tested many over the years and water is still the winner! Drilling part the way into your material but don't want to go all the way through? This is known as a blind hole. If you are looking to insert an object such as a bead or gemstone into your material and require the bead to be sitting flush in the stone, then it is better to use a diamond core drill that is slightly smaller in diameter than the hole you wish to make. You can then grind away the edges with a diamond burr so that your bead sits flush in the hole. "I love this tool - it makes it so easy to drill a hole in ceramic, and is one of my most used tools"
3. 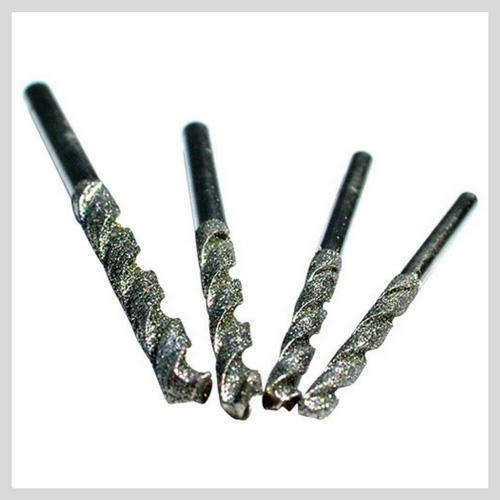 What is the difference between sintered and electroplated or coated diamond drill bits and burrs? Electroplated, or coated diamonds are bonded to the drill bit using nickel in a single layer, and although won’t last as long as sintered they are a cheaper alternative. Sintered diamond has been bonded to the matrix at very high temperatures and therefore has several layers of diamonds which by dressing or cleaning with an aluminium oxide stone will help maintain the life of your drill bit or burr revealing a new layer of diamonds each time. Electroplated, or coated diamond drill bits as they're more commonly referred to, tell us that the diamonds are coated onto the steel shank in a single layer, therefore once this layer has worn away, the drill bit will need to be replaced. These are the most economical and popular type of drill bits. Sintered diamond core drills and Sintered burrs have several layers of diamonds and therefore last a very long time but will also be more expensive than coated diamond drill bits. 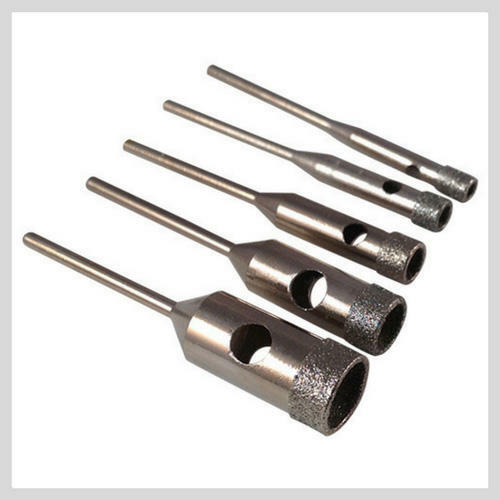 Sintered diamond bits require cleaning or dressing before use and after each use with an aluminium oxide stone, thus revealing a fresh layer of diamonds each time. Sintered core drills are popular with stone masons, and sintered burs with sculptors, glass engravers and stone carvers. 4. How Long Will My Drill Bit Last? How Many Holes will One Drill Bit Make? Your diamond drill bits lifetime will depend on many factors: speed, lubricant, pressure and the density of the material you're using. Unfortunately this is a 'How-Long-Is-A-Piece-Of-String' type of question as we have no way of knowing what components make up your material. If you're drilling through sea glass for instance these may be thousands of years old and we don't know the source of the glass. That said, some have achieved more than 250 holes in sea glass from just one bit! The same applies for drilling holes in china plates, we can estimate you may be able to drill 15 holes with one drill bit, maybe more, but it's difficult to really know the answer. Take a look at a chart of Mohs Mineral Scale of Hardness to see the comparisons between different materials. Be aware that drilling through hard gemstones can take a long time, be patient, you'll get there in the end. To gain maximum life from your drill bit and to prevent your material from cracking ensure you use little to no pressure, keep the speed on the slowest setting of your drill and always keep your material and drill bit cool with plenty of water. 5. How Do I Attach Diamond Drill Bits to My Drill? Will They Fit my Drill? Very small diamond drill bits ranging in sizes between 0.75mm - 3mm won't fit into a rotary drill or DIY drill without the appropriate collet or chuck to hold them. Dremel do a couple of attachments which will fix to your drill: The Dremel Collet Nut Kit and the Dremel Multi Chuck. A set such as the Diamond Drill Bits Set for your Dremel Tool includes the Dremel multi chuck along with two small diamond drill bits and two small core drills - well worth it if you're just starting out and want to test both types of diamond drill bits. Roughly about half of the diamond drill bit shank should be in your drill, leaving half of the working end of your drill bit exposed. Bottle Neck Diamond Core Drills as mentioned in the above section on 'What Are Diamond Core Drills?' have a 2.35mm shank and are therefore suitable to use in your Dremel type drill if you have a collet or Multi chuck with which to hold them. These are very popular with cold-working glass artists. 6. Problems with Overheating, Speed, Pressure or Diamonds Coming Away? Start your speed off on the lowest speed setting of your drill. Begin slow and increase as the drill bit goes through your material. However, ideally keep a consistently low speed. If the speed is too high this will cause the drill bit to overheat and your material to crack. Plus the drill bit will become dull quicker, therefore shortening the life of the drill bit. If the diamonds chip away or fall away from the shank it is probably due to too much pressure - let the drill do the work and apply very little pressure. Feel your way through your material. If in doubt, practice on a scrap piece of glass or a garden pebble until you get used to the technique. If the drill bit snaps then too much pressure is being applied. 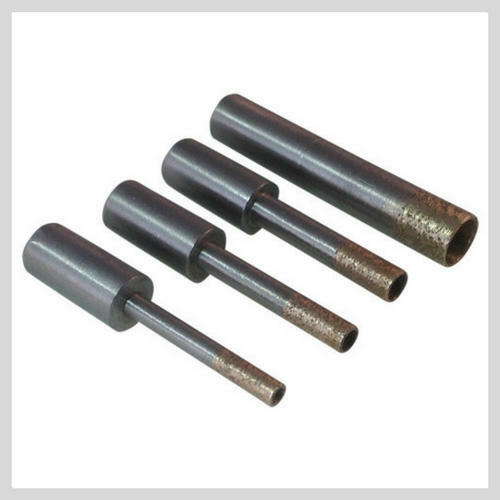 The shanks are made of hardened steel and will only break or snap under too much pressure. 7. Is It Safe To Use Water Near My Drill? It goes without saying that extreme care should be taken when using your drill near water. When drilling any kind of material you should always wear goggles and protective wear to prevent any flying bits of debris from causing injury. The same amount of care should be applied when using water near your drill. Water can either be fed onto your material via a pump, a running tap, a drip feed or you can immerse your material in the water ensuring about 1cm covers the material you are going to drill. If you're drilling a tile on the wall you can squeeze the water onto the tile with a sponge. If you're drilling large pieces of glass or stone you can create a putty ring which will act as a well for your water. There are oil lubricants out there but in our many years of experience we have found water works just as well, and of course is much cheaper! The viscosity of washing up liquid can help, add just a couple of drops to the water though, you don't want suds! The below image is a piece of beach pottery we drilled. The trough is a plastic takeaway food tray and the material the pottery is resting on is a DIY abrasive sanding block. We then filled the trough so the water just covers the piece of china being drilled, and just covers the tip of the drill bit. If you have problems with the drill bit skittering across the surface of your material angle your drill to start off the drilling. Once the initial hole is made you can drill from a vertical position. This mainly applies to those drilling holes through glass or smooth stone such as pebbles. Another option is to use a small piece of masking tape on the area where you wish to start drilling, this will help the drill bit from sliding around, very useful for drilling holes through tile or glass bottles, but this really only applies if you're using a larger drill say 6mm upwards, not with drill bits as small as 0.75mm - 3mm for instance. Our blog has lots of easy to follow methods on drilling through sea glass, glass bottles, how to drill plates, tiles, ceramic, granite, mirror and drilling holes though pebbles, gemstones and rock. Take a look. Diamond twist drills are intended to open up holes rather than create them. They are very popular with bead artists to increase the size of holes in beads and are ideal for increasing the size of holes in pearls. Sizes range from 0.5mm to 3mm. Tip: Also handy to prevent condensation build up in the windows of your house. If you're suffering with misted up double glazed windows you can use a 3mm twist drill to make a hole on the inside bottom corner window and the outside top corner window. Follow a suitable tutorial on this before attempting it. Diamond Ball Burrs are intended for shaping, engraving, carving and grinding. There are video's available showing people using ball burrs to drill holes but they are not intended for this purpose and are not nearly as good as the small diamond drill bits we mention at the start of this article. Shovel shaped and pointed drill bits are also available for drilling holes in hard materials but in our many years of experience these do not work very well. 10. Can I Drill Tempered Glass? 11. Core Drilling Bits. I Want A Core Rather than Drill A Hole, is This Possible? Diamond core drills, despite their name, are intended to make a hole, not obtain a core. However, many artists and scientists use them to extract a core of fossil lets say for DNA testing, and do so with great success. When buying core drills, the diameter size listed is the size of the hole you would achieve, therefore if you are using them to obtain a core you will usually need to order two sizes bigger, please check the technical information on the product page to double check. As an example, If you want a core of approximately 4mm, use a 6mm core drill. Mosaic and stained glass artists also use core drills to extract a core, thereby leaving them with a circle of tile, china or glass with which to add to their designs. Jewellers use the core as beads. You can file away the underside with a diamond file to make the tile sit flat in your design or remove snags and rough edges if using for beading purposes. Try making seed beads with the core you have left from a 4mm diamond core drill. Once you have the core, use a 1.25mm small diamond drill bit to drill another hole with which to thread your wire through. 12. What Speed Should I Use My Drill Bits At? Use your diamond drill bits at slow speeds, especially when making the initial hole. This will prevent any breakages of your material and help maintain the life of your drill bit. The lowest setting on your drill is advisable to use but if you are drilling a hole all the way through your material and you do speed up, take care to make sure you slow down when approaching the exit hole to prevent any cracks forming. Maintaining a slow speed when drilling will help prevent damage to your material and help to make your drill bits last longer. Now you know what to do with your diamond drill bits and how to use them, you have no excuse not to start that project you've been meaning to. Enjoy!